The HoM awards went to David Westhead, and Andrew Merrick. Congratulations to them. They will receive technical running shirts from HoM sponsor UP & RUNNING. 272 finishers including over 40 Harriers; new course records including a fabulous 39:31 set by Tom Adams; team wins for both men's and ladies Harriers teams; a record 70 juniors; over £1800 raised for Charity - another Ilkley Harriers event to be proud of. Thanks to everyone involved, especially the race organisers Lawrence & Jemma Basham. Results etc. on the Trail Race page. Well done to everyone who did Race For Life on Sunday. Thanks to Emma, Sue, and their girls for talking to runners about Ilkley Harriers and handing out leaflets: if any ladies fancy finding more about Harriers have a look through this page to get a flavour of what the Club does, and find out more about Harriers membership here. Neil Smith reports ... Named after the poet A. E. Housman, this year's annual LDWA flagship challenge event was based in Shropshire. It included sections of the Mortimer Trail, Offas Dyke path and Shropshire Way, and was actually 101.2 miles long with almost 17,000 feet of climb. I managed to get round in 27 hours 54 minutes, in 13th place. Tom Adams in his crisp new Yorkshire vest finished 10th overall, leading the Yorkshiremen's team to Silver (with Ben Mounsey 12th and Graham Pearce 15th running for Yorkshire for the fifth time). In the ladies race Yorkshire won the Bronze medal, the team including Helene Whitaker 15th and Sally Morley 20th. 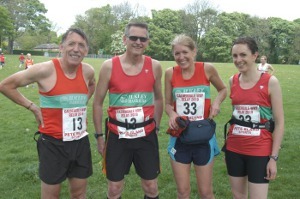 Results and photos on Valley Striders web site. Helen was also second V45 in the overall Triple Trail series. 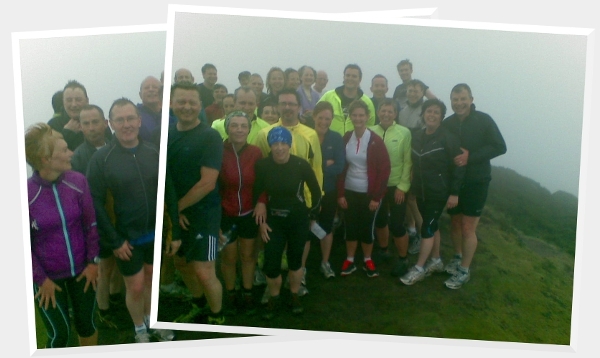 Thanks to the many Ilkley Harriers who helped with this super event. Another good turnout with 44 teams, including many family teams and juniors. Full results on the Badger Stone Relay page. Well done to Sally Morley and Helene Whitaker who, like Tom Adams, have been selected to run for Yorkshire at the Inter-Counties Fell Championships on 28 May. A few Harriers spotted in the results - any more? Hilda says "My first and only(!) marathon on a very blustery day in Edinburgh with around 20000 entries". Fiona Schneider reports ... After a heavy hailstorm as we were waiting to start, we had a dry run around Windermere. In fact, the conditions were suddenly very good for running. This has to be a favourite marathon course. I was 8th FV50 in 4.45.42 A new course record was set - S. Littler 2.32.08, on a course with an overall climb of 485 metres. Jane Bryant reports ... despite 2 of us having had the lurgy all week, 1 with dodgy ankle and 1 with very tired legs we came a fantastic 8th place. Last year we were 10th, so to come in the top 10 was great, and with a 48 yr old “ringer!!”. Official results. 37 Harriers, young and old, in the final John Carr race of the series. Tom Adams took overall 1st place in the series, with top-30 results from Mark Iley, Andrew Merrick, Sally Morley, and Nick Pearce. In the overall results by category, all 7 female juniors were Ilkley Harriers, led in by Lucy Williamson; Sally Morley was 2nd FV35 (4th F); Rebecca Mon-Williams was 3rd FV40; Sally Malir was 2nd FV45; Francis Westhead was 2nd junior; and Nick Pearce was 1st V55. 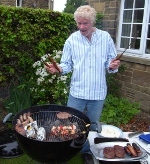 More on Saltaire Striders site. Of course, everyone's been doing the John Carrs to hone their speed for the fabulous Badger Stone Relays next Wednesday 25th May - see you all there! 30+ Harriers enjoyed a good run, good company, good fish and chips and good beer afterwards, but alas not good weather on the first of the Summer Away Runs. Photo: at Sharp Haw, Tim Ratcliffe. Ewan Welsh reports ... meandered over to Skipton on Sunday morning for the ‘Tough’ Ten road race realising that it was actually my first road race for about 4 years and first 10 mile road race in about 5 years. Skipton have resurrected this race, it’s certainly deserving of the resurrection, myself and John Coates where t’Harriers representation, in fact I last ran this in 2006, where, again, John and myself were the only Harriers. I think it’s the last time I spoke to John, where does the time go ! In a race with several long climbs (one particular long climb from about 1 ½ mile to approx 5 miles) and sharp descents, I found myself physically wilting at around 8 miles, finishing in 76 mins, John came in a bit after that, not sure what time, but elated that is was 5 mins faster than he did in 2006, (I was a few minutes slower than previous attempts, in the previous attempts I didn’t wilt at 8 miles, that was the main difference). I believe there were about 70 runners, I didn’t wait about for the results, I manage to suss out that only one runner came in under the hour, it’s not the fastest 10 miles you will ever run, it’s more like a fell race on tarmac (apart from watching out for traffic ), I did pass a few runners walking fell like up the hill, a bit surreal. Lee (that runs with Bingley and coached by Pete) was 1st in around 57 mins and the only one under the hour. Hopefully Skipton will keep this going as it merits a bigger field and is an excellent route, if you like Otley 10, Burnsall 10, Dent 14 and those type of road races then this is the another to add to you suite of races to do. Lee Morley reports ... a number of Harriers made the trip to the Lakes for the Fairfield race. The organisers slightly changed the course with it starting and finishing 500 yds up the hill above Rydal Hall, a killer finish after the &half; mile run in. From Dave Wilby ... Still awaiting the final version of results, but the small band of Harriers in attendance acquitted themselves very well indeed. The course was only 3.5 miles long but provided a true test of championship fell running (English Fell Champs counter) with a bit of everything thrown in including some very fast running initially, a steep runnable climb, an even steeper hands on knees climb, a run around the cairn, a steep descent, a bit of a scramble, some contouring then some absolutely lightening fast downhill running in to the finish. The ladies went off first and despite being world famous for her endurance feats, Helene Whitaker demonstrated her all round ability by leading home the Harriers ladies well inside the top 10 overall, and also taking first V45. Sally Morley wasn't far behind at all, possibly sneaking in to the top 12, a great performance in such a quality field. The team was rounded off by Emma Barclay, and they may well have taken the 1st team place. In the men's race, Tom Adams was looking to see where his excellent recent form would put him in the national scene, and he did himself proud finishing 16th in 29:36 a very high quality field. There's no doubt he'll only get better as he does more category 'A' fell races, so watch this space. I claimed the final scoring spot in 50th which was only the 2nd time since 2007 that the Harriers have had 2 points scorers in the same championship race. Jim & Eric were also in attendance, Jim sporting some fashionable cargo shorts as he'd forgotten to pack his usual racing shorts. Fortunately it stayed dry for the race as he would have doubled in weight if they'd started holding water!! Not sure of any age group positions as yet. Well done to all, a tough race in a fantastic setting. Next champs race is Duddon Valley (20 miles) on 4th June, then Loughrigg Silver Howe (8.5 miles) on 26th June. Entry details on FRA website now. And from Emma Barclay ... the Ladies had a good strong team out for this event, we know that we got first ladies team which is a great result. Helene (7th) and Sally (11th) both had a good race, I came in as 3rd counter in 17th position. Not sure how we did in the Vets Ladies Team until official results are issued. A cracking short race and very well organised. Well done to Tom and Dave who both did very well. 36 Harriers including juniors were out for this one. Many ran faster than last week, including Tom in his 2nd race in 2 days, but he was beaten by the fastest John Carr win in several years (since 14:41 in 2007, in fact). Full results on Saltaire Striders site and a photo-compilation from Soobedoo for Facebookers on our Facebook page. Well done to Tom Adams whose recent good results have earned him selection for Yorkshire in the Inter-Counties Fell Championships on 28 May. 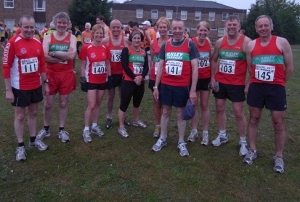 There was a sea of red and green vests at this year's Jack Bloor Races, always well supported by Harriers. There were 46 Junior Harriers (over a third of the field) in the junior races. In the senior race Tom Adams finished a close second to P&B's Graham Pearce, the two well ahead of the rest of the field. Ilkley had 3rd team, 1st ladies team with Emma Barclay 3rd lady, and over 40 runners (plus additional 2nd-claim runners and Junior Harriers parents!). 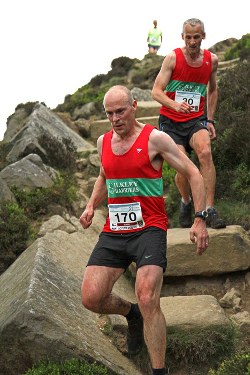 Lyn Eden reports ... Jim and I did this lovely 4 mile [approx], fell race, the third of a nine race series (web site) following an afternoon in Sheffield with our grandchild. We are gradually getting back into running after our worst cough and cold ever which had taken a month to get over. It was, therefore a pleasant surprise that we both ran our fastest run in this series this year. Both Ilkley's teams successfully completed this - the results are up now on Halifax Harriers' site - the ladies team was 36th overall and 2nd ladies team; the open team was 59th overall. From Jane Bryant ...I went to the seaside on Sunday to compete in this 10k, which is primarily a charity fun run along the front and back. It had to go north this year due to the south side being closed due to road works, although the “Start/Finish” banner people forgot this and put the banner the wrong way round to confuse us. There was an area at the front for the “serious” runner’s which appeared to include several men in “morph” suites. The female announcer, wondered if they definitely were men, and yes, I can categorically state that they were! A torrential downpour on the start line helped cool things down and off we went. I got to the 5k in 19.30 (don’t know what happened on Wed!) and then turned to come back and was met by the wind, so it was a return 5k in the wind. Didn’t feel like I slowed, as I stayed with the same crowd, but finished in 41.15. As I finished, I was told I was 3rd lady, but then I saw 3 women already finished and it turned out I was 5th! No prizes for being an old lady in this race, no chip, but a decent medal for the kids to play with and a good day out. Definately 1 to put in the diary for a fast 10k next year, weather dependent. The Celebrations continued with a Garden Party, chez Bennett, enjoyed by 40-50 Harriers. There was brilliant BBQ-ing, fantastic food, good company, and a toast to "Ilkey Harriers, 25 Moor Years" with Birthday Champagne provided by the Club. Thanks to Alison and Andrew for all their hard work setting this up, and for their generous hospitality. Amanda Parnaby reports on ... 23 miles in and around Malham. I reached Gordale Scar before the early afternoon rain and this, coupled with encouragement from fellow participants, persuaded me to once again take this route rather than what, in future, will definitely be my preferred option of the long way round. Despite my problems at Gordale Scar it was an enjoyable day. Finished in 6 hrs 5 mins. Some excellent individual performances, but not enough of us made the journey to get the team results that we'd like! Let's do better at HDSRL#2 at Harrogate on 26 May! Full results and photos on www.harrogate-league.org.uk. This is a counter in the Ilkley Harriers Race League. 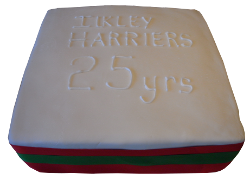 Ilkley Harriers was 25 years old on Monday 1st May! Alison Frost was 411th in 1:59:35 (PB by 4m 50s). She reports "one of the most scenic half marathons, glorious sunshine and a fresh easterly wind made for a perfect day out."